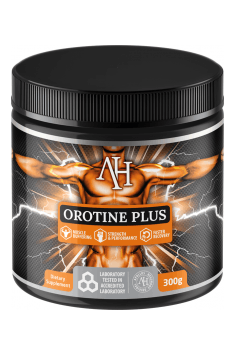 Apollo’s Hegemony Orotine Plus is a dietary supplement containing a combination of creatine with orotic acid – tri-creatine orotate. Orotic acid fantastically complements the activity of creatine and, apart from its basic activity (that is increased energy production, an increase in strength and muscle mass and optimisation of physical and mental performance), it gives the substance additional benefits for sports performance; for example, it increases carnosine levels in muscle tissue, thanks to which it affects the regulation of intracellular pH during workout. In addition, the preparation contains betaine anhydrous, which reinforces the activity of the preparation (it participates in endogenous creatine biosynthesis and affects the right water balance in cells) and protects the cardiovascular system by helping to reduce homocysteine levels. Tri-creatine orotate is a combination of three molecules of creatine monohydrate with orotic acid. The addition of orotic acid to creatine reinforces the benefits of supplementing creatine, which, as most people know, has powerful properties confirmed with scientific studies – it supports the formation of muscle mass, improves strength and endurance, supports energy processes, and enhances the functioning of the nervous system: it exhibits neuroprotective properties, has a positive effect on cognitive functions, improves the state of mind, and stabilises the mood. Orotic acid was isolated for the first time at the end of 1940 and for a short time, it was referred to as vitamin B13. Unfortunately, tests did not confirm vitamin-like activity of orotic acid, so it cannot be considered a vitamin. However, orotic acid has other properties, out of which the most valuable one for physically active people is its influence on increasing carnosine concentration in muscle tissue. Absorbed orotate is eventually converted to beta-alanine, which can then play the role of a precursor in the synthesis of carnosine in skeletal muscles, the brain and the heart. Carnosine is one of the basic dipeptides, which occurs mainly in muscles, as well as in other tissues and organs (like the central nervous system, glial cells, and olfactory neurons). The content of carnosine in tissues reduces with age, which can be correlated with a higher risk of developing some diseases. Carnosine exhibits powerful antioxidant properties; for example, it prevents lipid peroxidation, buffers reactive oxygen species in tissues, increases the activity of superoxide dismutase, chelates copper and iron, thanks to which it blocks the production of free hydroxyl radicals. That is why the role of carnosine is so important in protection against the factors of cellular and environmental stress. However, it is not the antioxidant activity that makes carnosine such a desirable substance, especially in the sporty environment. Intensive physical effort is connected with a decrease in substrate reserves in muscles and an increase in metabolites. The accumulation of metabolites, increased production of lactic acid, and an increase in hydrogen ion concentration can have a negative effect on the functioning of muscles, contribute to a drop in strength, which then leads to faster tiredness. Carnosine is a perfect physiological buffer for tissues, thanks to which it plays a key role in intracellular buffering and maintaining pH in a physiological range, especially in the tissues that are particularly exposed to disorders in the acid-base balance because of glycolysis-based energy production (mainly skeletal muscles). As mentioned before, orotate eventually becomes converted into beta-alanine. It is believed that orotate can be considered kind of a form of beta-alanine with “delayed release”, which can be tolerated better than beta-alanine itself. As you probably know, after consuming beta-alanine in larger doses, you can experience the feeling of paraesthesia, that is tingling of the skin that can last about an hour. It seems that orotate supplementation, even in larger doses, does not contribute to the occurrence of the effect, probably because it is converted into beta-alanine gradually. Thanks to that, orotate can constitute a practical strategy of increasing the levels of carnosine and its derivatives in the organism without the effect of paraesthesia, which accompanies the use of increased beta-alanine doses. Apart from tri-creatine orotate, the preparation also contains betaine anhydrous (TMG, trimethylglycine), which additionally supports the activity of the product: it stimulates the production of carnitine and creatine, exhibits anabolic properties, protects the cardiovascular system by reducing homocysteine levels, and protects liver cells. To sum up, Apollo’s Hegemony Orotine Plus is a combination of benefits stemming from creatine and orotic acid supplementation, which can constitute a unique complement by increasing the duration and efficiency of workout and delaying muscle tiredness, especially during intensive training. Mix 1 portion (approximately 6.25 g) with 50 ml of water or juice upon waking and post-workout. Mix 1 portion (approximately 625 g) with 50 ml of water or juice, after a meal. The preparation will prove excellent in training characterised by maximum intensity and short duration. Creatine orotate is very often used by people who train martial arts and other speed-strength sports.